The Mirai is here and it’s the start of a new age of hydrogen-powered zero-emissions mobility. The name Mirai means “future” in Japanese, but to make our new Toyota Fuel Cell System technology successful we know it has to be accessible and attractive to people today. Although Mirai has an extremely advanced powertrain and uses a new type of fuel, the Mirai is a regular mid-size, four-door sedan that is every bit as practical, safe and easy to drive as a conventionally powered family car. It will go as far as a similar size petrol car on a full tank of hydrogen and refuelling from empty takes between three and five minutes. The rewards are a quiet, smooth drive, strong performance and no tailpipe emissions other than water vapour. Learn more about the Mirai. The Toyota Fuel Cell System used in Mirai produces electricity from a reaction between hydrogen and oxygen. You fill up with hydrogen fuel, in the same way as you buy gasoline or diesel at a filling station. The fuel is contained in high-pressure tanks and fed into a fuel cell stack, where the hydrogen and the oxygen found naturally in the air react with each other and generate electricity. As in a petrol-electric hybrid, the electricity is boosted in voltage to drive the electric motor. Further energy is captured in a battery every time the car brakes or slows down, which contributes to even better fuel economy. Our decades of research and development in hybrid electric technology have helped us to be the first around the world to make a system with a power density of 3.1kW per litre. Our fuel cell system is in fact a development of our hybrid electric technology, with a hydrogen fuel cell stack taking the place of a petrol engine. 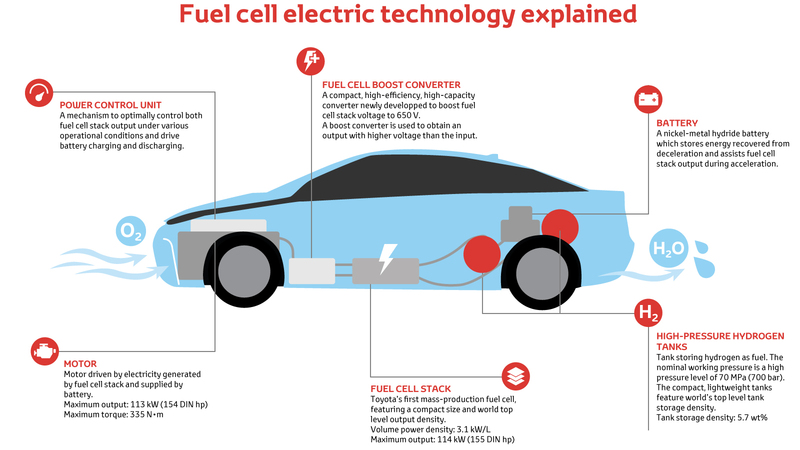 The fuel cell produces electricity that powers the motor that drives the car, all with no emissions other than water. Hydrogen is not a new source of energy. It has been widely used for more than a century, and is now recognised as a viable power source for vehicles with the potential to eliminate carbon emissions and reduce dependence on the world’s shrinking supplies of oil-based fuels. Hydrogen (H) is all around us. In fact it is the most common atom in the universe. However, it is always found tied to other elements, such with oxygen in water (H2O). That means we have to find ways of isolating it in order to produce pure H2 hydrogen fuel. There are plentiful natural resources we can use to do this, including making use of renewable energy such as wind and solar power. Did you know hydrogen can be produced from practically anything – water, lemonade, waste products, even real bullsh*t. We’ve explored how this works in this series of short films. We believe there are great environmental and social benefits to be secured from building a future society based on using CO2-free hydrogen and renewable energy sources. This forms an important part of our long-term Environmental Vision 2050 and our desire to create true harmony between society and nature. Hydrogen is a clean, efficient means of producing electricity that is not vulnerable to fluctuations in supply. As well as creating no CO2 emissions when used, hydrogen fuel also has a higher energy density than electric batteries and is easy to transport and store. It can be used not only for powering vehicles – not just private cars but buses, taxis, forklift trucks and others – but homes as well. Did you know that a Mirai could power an average home for up to a week in an emergency (in Japan and the USA) ? We believe the hydrogen fuel cell system is a technological breakthrough with the potential to deliver sustainable, zero-emissions mobility as part of a low carbon society. We began our research and testing programme 20 years ago. About the same time we started work on Prius, and we are confident that we have succeeded in capturing the benefits hydrogen can offer in a vehicle that meets the needs of today’s customers. At the same time it addresses future concerns about air quality and sustainability. Just like hybrid electric power, we know that it will take time for fuel cell electric cars to become established as a popular, mainstream choice. To make them accessible, we need to make sure they are affordable, too. During our development of Mirai, we were able to reduce the cost of our fuel cell system by 95%, compared to its predecessor, the 2008 FCHV-adv. We achieved this by making its components smaller, lighter, more efficient and cheaper to produce in volume. The system also shares many common parts with our hybrid electric models, including the electric motor, which saves cost and increases reliability. We are confident that, as with hybrid electric vehicles, fuel cell electric vehicles will become increasingly affordable as sales grow. Our aim is to be selling tens of thousands of fuel cell electric vehicles a year worldwide by 2020. It is true that we are in the early stages of developing a network for making, distributing and selling hydrogen fuel. We know that providing these facilities is essential to support the first fuel cell electric vehicle customers and as a manufacturer we are active in promoting infrastructure development with industry and government partners, for example through our participation with in Europe’s Hyfive project. We also take an active role in the Clean Energy Partnership, Europe’s largest hydrogen mobility demonstration project, and UKH2Mobility which is promoting the commercial deployment of hydrogen fuel cell electric vehicles in the UK. Progress is being made and at the time of Mirai’s launch in 2015, there were already 40 refuelling stations in the European countries where it went on sale, with hundreds more scheduled to follow. As well as securing a good number of sites, it is important that these are strategically located, serving major cities and principal routes that link them. Hydrogen fuel can be obtained from many different sources that are in plentiful supply. In Europe, most hydrogen is currently produced from steam reforming, which uses natural gas as the source material, or from electrolysis which produces hydrogen out of water. It is already possible to use renewable sources, such as solar, wind or hydro power for the electrolysis process. This is key to ensure the “well to wheel” carbon performance of hydrogen is excellent. All hydrogen production in Denmark is from renewable sources and Germany and other countries are expected to adopt this “green” type of hydrogen production in the coming years. The issue of the efficiency of different vehicle technologies is not just about what can be achieved today. It is also important to think how about their benefits can be sustained in the future. That is where we see a valuable role for hydrogen as a mainstream, low-emissions source of energy that can be produced from renewable sources. With Mirai and our hydrogen fuel cell electric technology we are also delivering a practical solution – a full-size sedan that needs no overnight charging and can cover the same distance as a similar-sized petrol car on a full tank of fuel. This combination of convenience, performance and environmental efficiency cannot be matched by an electric vehicle today. Smooth and performant, it’s like driving any other car. Only emits water vapour at the tailpipe. Oxygen and hydrogen react in the fuel cell stack, producing the electricity to power the wheels. Fuelling takes between three and five minutes. It will go as far as a similar size petrol car on a full tank of hydrogen. We have designed every aspect of the Mirai to be as innovative, efficient and reliable as our fuel cell technology. ‘Mirai’ means ‘future’ in Japanese. Toyota Mirai Awards We have a proud history of environmental achievements. Being the first to mass-produce the pioneering hybrid vehicles back in 1997, we have gone one step further by launching the Toyota Mirai... Long-distance driving with Toyota Mirai - a hydrogen fuel cell car Europe’s network of hydrogen fuelling stations is continually expanding. In practice though, is it really possible to drive a hydrogen fuel cell car from northern Europe to southern Europe? Jacob Krogsgaard, CEO of H2 Logic, put it to the test with his Toyota Mirai. The Toyota Mirai: A start for the better Our world faces many challenges, with Mirai we are making a start for the better, to ensure that we can enjoy a future that cares about the environment. Fuel Cell Technology Fuel cell vehicles (FCV’s) are powered by fuel cell stacks, which generate electricity from a reaction between hydrogen and oxygen from the air.